Striker Taiwo Atieno was signed by Ian Rush on a one month loan deal from Walsall at the start of February 2005 and made his debut, as a substitute, in the 3-0 home defeat to Cheltenham. Four days later he made his first start and scored his only goal for City in the 3-1 win over Rushden and Diamonds. The former Walsall trainee, who had scored against Chester while on loan at Rochdale in December 2004, made 3+1 appearances before returning to the Bescot Stadium. In his second professional season at Walsall the Brixton born forward spent the first half of the campaign on loan at Kidderminster. Following his return to Walsall he managed one first team start before making three substitute appearances on loan to Darlington at the end of March 2006. He was released by the Saddlers at the end of the 2005/06 campaign and signed for Dagenham and Redbridge but after only three appearances returned to the Midlands with another Conference side, Tamworth. While playing for the Lambs Taiwo showed his goalscoring potential with 12 goals in 39 games although he could not prevent the Midlanders relegation from the Conference. In June 2007 he moved to America to play for USL First Division side Puerto Rico Islanders where the former Tranmere and Northern Ireland forward Colin Clarke was head coach. His goals helped turn around the season for the Islanders as they reached the play-offs after a poor start. Big Dave Cameron was one of a host of forwards brought in by Mark Wright before the start of the 2002/03 season. The burly striker made his debut, as a substitute, in the first game of the season at Kettering Town but was red-carded when he made his full debut at Telford United two days later. 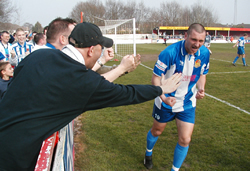 With strong competition for places up front at the Deva Stadium Dave was unable to make an impact at the club and spent periods on loan at both Droylsden and Telford United. In his time at Chester Dave made 7+8 Conference appearances and contributed two goals, the winner at Margate and a penalty at Farnborough Town. The former Lincoln player was also given the responsibility for taking the fifth Chester penalty in the second leg of the play off final against Doncaster Rovers in May 2003 but his miss consigned City to another season in the Conference. Placed on the transfer list at the end of the 2003/04 season he signed for Halifax Town on a three month loan deal in August and, following his return, signed for Droylsden after an initial loan spell. After two seasons with the Bloods Dave returned to his native Wales and signed for Rhyl in August 2006. The experienced striker made a bright start at Belle Vue with a goal on his debut against Cwmbran and his no-nonsense style made him a great favourite with the fans. In two seasons at Rhyl he made 77 appearances and scored 23 goals. He also featured in the Lilywhite’s 2007/08 UEFA Cup tie against Finnish side FC Haka. In March 2008 Dave was appointed manager of Unibond North side Bradford Park Avenue and got off to a winning start with a 3-0 victory over Lancaster City. Full back Matt Doughty graduated through the youth policy at Chester and was given his debut in the opening game of the 1999/2000 season by Kevin Ratcliffe. He became a regular in the side from September but then lost his place in the New Year when Ian Atkins took over from Terry Smith. He continued to progress in City’s first year in the Conference and in May 2001 was a member of the City side that won the Nationwide Variety Club Trophy at Kingstonian. During the season Matt had attracted interest from Premiership clubs and was unlucky when a proposed trial with Southampton fell through due to injury. Despite this interest a technical error in his registration documents meant that he was free to leave during summer 2001 and former manager Graham Barrow recommended him to Rochdale. In his first game for his new club, at Oxford United, Matt scored the opening goal of the game giving him the distinction of becoming the first goalscorer at the brand new Kassam Stadium. Matt remained at Spotland for three years, playing either at left back or left midfield, but was released in summer 2004 after 96+12 league appearances. A drop down to the Conference with Halifax Town followed and he was on the losing side against City in a Second Round FA Cup tie in December 2005. Matt has now been at the Shay for four years and is a regular at left back having made well over 100 appearances for the club.